Aniken Graphics, a joint venture between Hamillroad Software, a UK based prepress software solutions company, and Apex International, a global leader of anilox and metering products, have today announced Chespa as the Phase One Trade Shop for Bellissima Digitally Modulated Screening (DMS) in Austria & Poland. “Phase One sales of Bellissima DMS involve the use of Apex GTT aniloxes, and MacDermid or DuPont plates as this proven technology solution works ‘out of the box’ and maximises everyone’s success when used.” Harvey concludes. Chespa offers its customers the highest quality of service to ensure their strategy for growth. Chespa has developed over 26 years from a small local company to now an established large group with an international reach via the sites and offices located across most of Europe and the world. Due to the quality and reliability that Chespa prides itself on, as well as the investment and development of modern technologies, the company has won the trust of large multinationals and has been the main supplier to many print sites globally. Chespa offers its clients a wide range of goods and services including printing inks, photopolymer plates, flat and rotary dies and the prepress preparation and processing of graphic repro. Included in their offerings, they supply a wide range of inks, water-based and solvent, and coatings, designed for use in flexo, gravure and digital printing on a variety of substrates: corrugated and laminated papers, coated and uncoated substrates, tissue, envelopes, bags, labels, aluminium foils, PE, PP, PET, PVC. The entire production is supervised by their in-house laboratory research and analysis team. Utilizing cutting-edge technology, Chespa produces printing plates according to the customers’ explicit requirements for the job, including machine, screening method and types of film. “We promote a 7C system (inks and plates for flexo print), which allows you to achieve a greater color gamut. This is commonly used when a product line with a similar layout, but different varieties/flavours is in production. 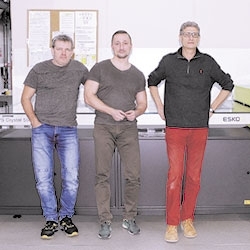 Thanks to this technology, we are able to create an extended gamut fixed palette set of inks which makes the whole process more economical for the printer,” Stawinski concludes. Chespa’s Repro Studio (CRS) was created with the aim of expanding the range of services offered by the Chespa group. CRS is targeted at the brand owners, producers of the food industry, who sell their products locally and globally. The brand owners want to ensure that the color packaging printed and produced is consistent regardless of whether it is printed in Germany or the United States. CRS are able to help brand owners achieve this consistency by managing their brand assets, using technology and systems to ensure that this consistency is delivered. Working optimally at 4,000 dpi, the patented screening includes features such as 100% solid surface patterning options and solid object protection. Printing press issues including bounce, barring and slur are all reduced significantly and in some cases eliminated. Bellissima DMS also delivers on ink savings, which can be augmented by GCR based software, improves the efficiency of the press room, and utilizes existing printing press equipment. From the left: Arnold Jendrusz - Plate Production Manager, Rafal Krutof - Software Engineer and Peter Stawinski - Head of R&D Dept.